Tens of thousands of angry unionists took to the streets for Melbourne’s Change the Rules rally on 10 April to change the government. Between now and 18 May we need more mass stopwork rallies and demonstrations to finally kick out the Coalition government on the best possible terms. The national refugee rallies on 14 April and the 1 May union rally in Sydney are the next steps to galvanise the anti-Liberal anger and set the political agenda for real change. Scott Morrison’s budget was a last desperate effort to buy back support. But the budget was more of the same with Morrison shovelling massive tax cuts to the wealthy. When fully implemented, 54 per cent of the benefits go to the top 20 per cent of income earners, according to the Australia Institute. John Howard tried bribing the electorate with tax cuts in 2007—and he ended up humiliated, losing his own seat. The Liberals have spent six years ruling for the rich. Their first budget, in 2014 under Tony Abbott, revealed their agenda of massive cuts to health and education spending, universities and the dole. While much of this was blocked in the Senate, the cuts to health and education have never been fully reversed. The Liberals imposed $2.2 billion cuts to universities in late 2017, and have forced students to repay HECS loans at a lower income threshold. The Coalition fought to protect the banks from a Royal Commission—until their own MPs were set to the cross the floor to support it. The Liberals have also imposed a vicious anti-union agenda, reintroducing the ABCC construction police and imposing bigger fines on unions for breaching the anti-strike laws. They have consistently used racism and Islamophobia in their effort to win popular support, imposing brutal anti-refugee policies through a naval blockade against refugee boats and the torture of asylum seekers on Manus Island and Nauru for almost six years. As the election campaign begins, the Coalition are desperately thrashing around. They are even claiming that Labor’s policy on electric cars will mean the end of four-wheel drives, tradies utes and, wait-for-it, the weekend. Labor’s policy is simply a target for 50 per cent of new car sales to be electric vehicles by 2030. Modelling for the Clean Energy Finance Corporation shows that electric vehicles are likely to make up 29 per cent of sales by 2030 even if the government does nothing. Their last-minute tick for the Adani coal mine is just the latest confirmation that the Liberals are a party of climate deniers. The Coalition’s other big scare is that Labor is going to raise taxes. But, as usual, the Liberals are simply defending the wealthy top end of town. Shorten has committed to reducing negative gearing on extra houses and dividend imputation, both of which will hit wealthy shareholders, raising a modest $9.5 billion a year averaged over ten years. By maintaining current tax rates on corporations and the rich, Labor has a significant war chest. Labor has promised to boost spending on schools, TAFE and hospitals—with its plan to make cancer treatment free and cancelling the fees for 100,000 TAFE courses announced in Shorten’s budget reply. However, his reply speech also contained a warning of Labor’s absolute commitment to play by capitalism’s rules, as he promised, “stronger surpluses, paying down national debt faster” and guaranteeing an increase to put, “defence spending at 2 per cent of GDP”. But Labor will not commit to increasing Newstart or single parent payments. The Greens have been left floundering by Labor’s tack to the left. 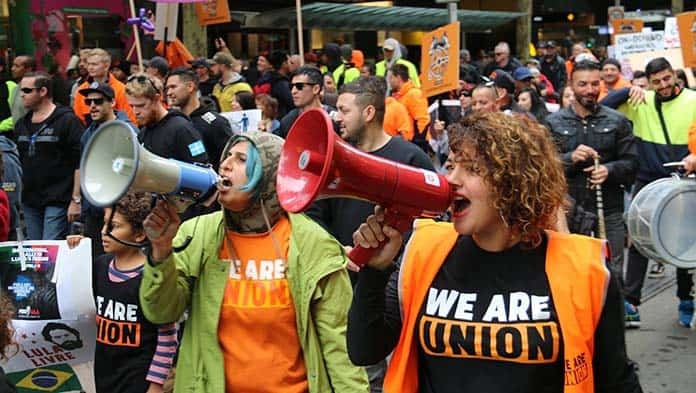 Their inability to put working class demands that the left could fight around—such as the right to strike and industry bargaining—at the centre of their campaign means many unionists are likely to vote Labor. But The Greens’ policies around climate change and refugee rights are clearly to the left of Labor. To get the Liberals out, Solidarity supports voting 1 Greens, 2 Labor. But what will be crucial is what happens after the election. On climate change, refugees, Newstart, the right to strike, it will be strength of the unions and social movements to keep fighting that will determine if there is going to be real change. The Palm Sunday refugee rallies will be both a chance to march against the Liberals and to demonstrate that the movement will keep campaigning until every single refugee and asylum seeker comes off Manus and Nauru. To stop climate change, end inequality, and to change the rules for workers and refugees, we need more than a change of government. We need to fight to change the system. Join us to help build the struggle for a society that produces for need, not greed.